Mixing prints can be a somewhat tricky trend – in the past, I have played it pretty safe & always included stripes (see previous looks with florals, dots & leopard). But something about the warmer season has me stepping outside my comfort zone and taking a risk with a busier blend of prints. Since the colors are the same in these two pieces, the patterns work well together without being too over-the-top. And I kept the accessories minimal to further simplify the look – my new favorite cuff (under $30) and a fun statement ring that I may not take off all summer long (such a gorgeous color)! WHAT A GREAT IDEA!!!! 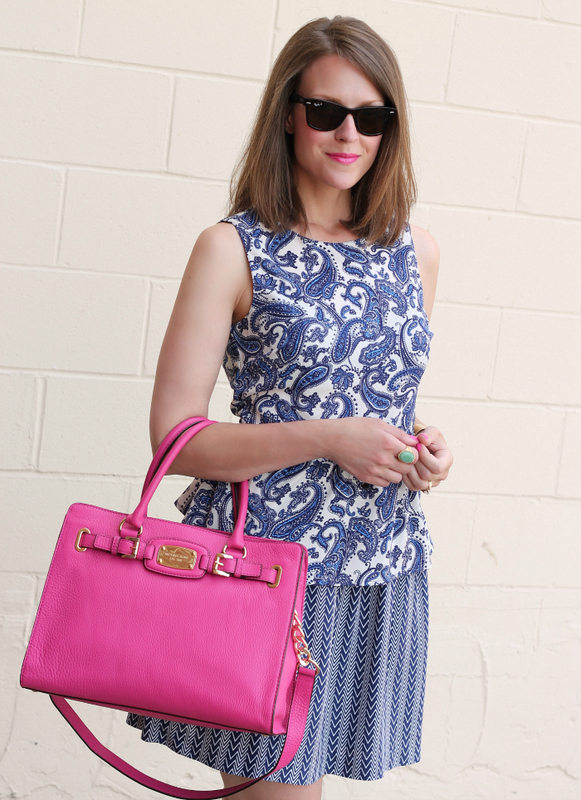 AND I LOVE HOW YOU HAVE GIVEN THIS DRESS AN UNEXPECTED POP OF COLOR WITH THE PINK BAG. LOVE THE OUTFIT. Very cute, those patterns look great together. I am loving those heels and that bag! Those shoes match the mixed prints so well too! LOVE the straight hair. I would've never thought to mix those two patterns, but they totally work! You look great. These patterns that you paired blend so seamlessly together- it is as if they were meant to be! I am just loving those shoes! 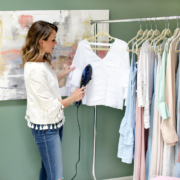 Oh, and your hair looks great! Hope you had a great weekend! I love a hot pink bag for summer!! So cute! This is one of my fav outfit of yours. Love the colors & the pattern mixing. This is a beautiful top, I love the paisley pattern. 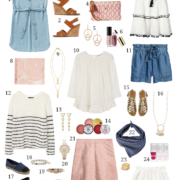 I saw quite a few great F21 pieces on you recently and definitely have to check out their collection again. That's a very striking outfit, really like it! You are right print mixing is def a tricky business and if done well can look amazing as you have demonstrated here. Sticking to the smae colour palette works really well. Loving the pop of colour from the bag. Summer is such a fun season I love seing people mixing and clashing their prints and colours. LOVE! how about we trade shoes for a few weeks?! 🙂 Adore yours, too! Such great pattern mixing here, and awesome skirt find… didn't see this on the web site. This is SO my post on Friday. Mixing florals and stripes or stripes and polka dots is cute but I'm kind of over it. I tried mixing 3 prints. Could be a hot mess but definitely time to step out of the comfort zone. These prints look great together! Love that pink bag too. Super cute! I especially adore the pattern of that skirt. 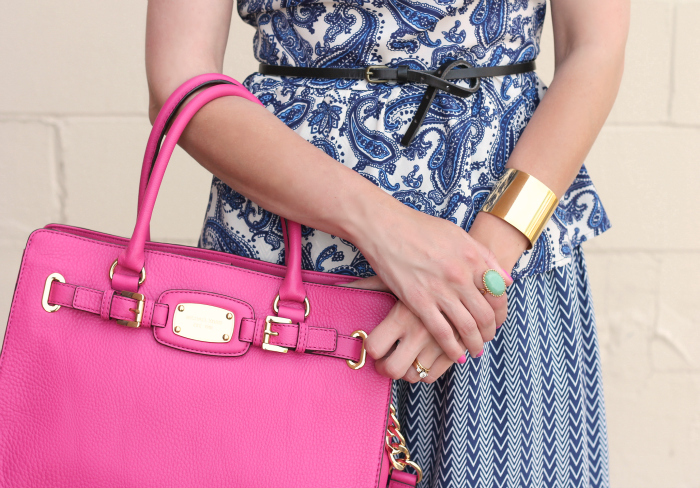 Absolutely love the print mixing going on here with the pop of pink. Stunning! Also- I love love love your hair straight!! So sleek. 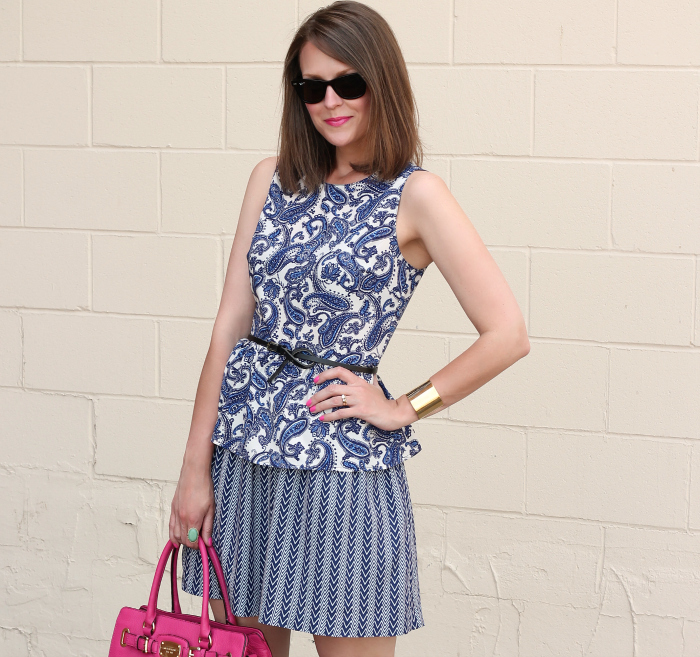 I love your mixing of Prints keeping it all in the Blue+White Family looking Tres Chic. Did you chop off your hair a little bit, also? Also, Beautiful Kimberly, I featured one of your Lovely Outfits of late in my Week's Best Looks post below. So check it out. As usual, I Love Your Style. Make sure you follow along & support my blog too. Much appreciated. Oh hey pretty girl! LOVE the idea of mixing prints but in the same color family…so cute! This prints go so well together! Love the pops of pink, and your hair looks gorgeous in these pics! 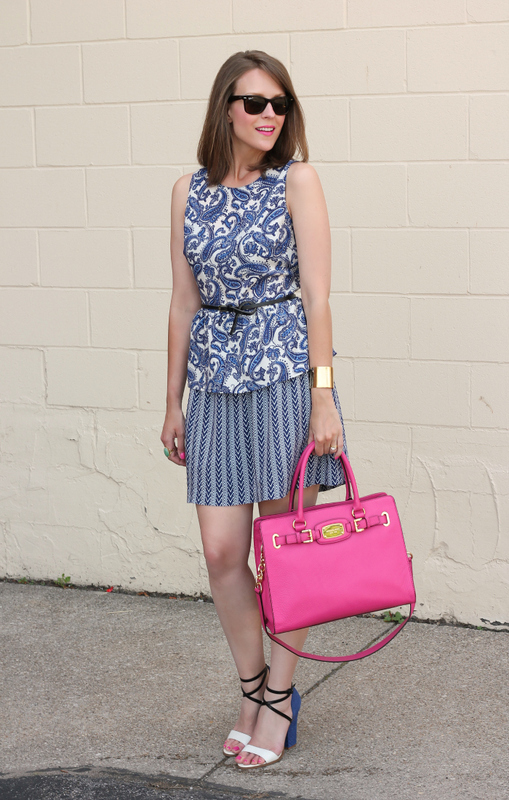 What a wonderful mix of patterns & prints Kim….the pink purse nailed it all together! This might be my favorite look of yours ever! I love the color matching, print mixing and those shoes pull the whole look together! I am definitely going to replicate at some point! I love this pattern mixing look! And those shoes are STUNNING! Love how you mixed the prints here. I'm all about paisley lately! Adorable! Love the mix or prints and the pop of pink! I love the mix of prints, your shoes, and the pink bag. nice! I love this look! Great mixture of patterns and the addition of the pink is genius! I LOVE this! It almost looks like a dress – so cute! These prints look perfect together… loving the look! LOVE that Forever21 top and what great shoes and cuff! Stepping outside your comfort space really paid off because this outfit is fantastic. I love your shoes and that top is so feminine and sophisticated. love your hair and the outfit. I love this mix! The pops of pink are SO pretty! I love this look along with the pop of pink on your purse, nails, and lips! So fab! This is a really good combination! Love the pop of color pink to it!! Such a great pink bag, and I absolutely love those heels! That paisley top belongs in my closet NOW!! Beautiful! I'm assuming you got a small? How tall are you for reference? I feel like peplums always look bad on my body because of my height/torso. Love these prints together! Your hair looks so pretty! LOVE the Hair, Love the Bag, Love the shoes! Love the patterns! LOVE IT ALL!! Ah, these heels! Love the pattern mixing! I can't believe you found the perfect shoes for that outfit. What a great way of showing us how to mix patterns. Beautifully done Kimberly! this lipstick is PERFECTION on you miss! I must ask you what lipstick you wear, the color is phenominal on you! That outfit is so adorable.